Blue Balliett centers her most recent book around the rhythms and themes of Langston's Hughes poetry, but the story is firmly rooted in today's urban American landscape. Balliet's novel touched me - it's a powerful, emotional story of the way a young girl tenaciously holds fast to her dreams, in the face of terrible circumstances. One bitterly cold winter afternoon, Early Pearl's father disappears. One minute Dash is riding his bike home from work, and the next he is gone, without a trace. As eleven-year old Early, her brother and mother reel from the news, their apartment is ransacked and they are suddenly on the run without any money. With nowhere else to go, the Pearls seek refuge in one of Chicago's homeless shelters. Early is certain that her father is still alive and that if she pays attention to the clues, she will be able to find him. Through it all, she is steadfast in her certainty that she needs to hold fast to her father's dream that they are a family that will survive. "What happened at 4:44 on that grim January day was wrong. Wrong was the perfect sound for what the word meant: It was heavy, achingly slow, clearly impossible to erase. Wrong. The word had a cold, northern root as old as the Vikings. Balliett's writing is imbued with rhythm, description and meaning -- in a way that got right to my heart. Balliett shares with her readers her love of language, of words, of ideas. But she shares much more. She shares her hope and optimism that even in hard times, we can hold fast to our dreams. Through Early's story, she gives a face to homelessness, making sure that readers think about what it would be like to suddenly lose everything. It might seem cliched to talk about giving a face to a problem, but I was struck by how easy it was for the police to ignore the Pearl family. "But what’s wonderful about this book, overshadowing the plot flaws, is the way Balliett so thoroughly gets inside the mind of a child accustomed to love and protection—and who now sees her life slipping away. Sadness and stoicism mingle freely in ways that will pierce all readers. Early is a clever heroine, and her smarts are enhanced by the poetry of Langston Hughes, which ripples beautifully through the story and infuses it with hope." 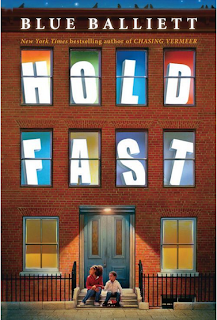 Hold Fast is getting positive early reviews, both from students I have shared it with and professional journals. It's gotten starred reviews from Booklist and Kirkus. The Chicago Tribune has a very interesting article on Hold Fast, interviewing Balliett as well as homelessness activists. Share this with children who love books that get to the heart and make them think about bigger issues, like Rules by Cynthia Lord or Out of My Mind by Sharon Draper. But also share it with children who love language, poetry and words. The review copy was kindly sent by the publishers, Scholastic. If you make a purchase using the Amazon links on this site, a small portion goes to Great Kid Books (at no cost to you!). Thank you for your support. Funny books draw kids to them, time and time again. Whether it's classics like Ramona the Pest or modern bestsellers like Big Nate or Diary of a Wimpy Kid, kids love books that make them laugh out loud or giggle to themselves. Tonight's monthly #titletalk chat on Twitter focused on funny books. As a good friend Cathy Potter wrote about her students, "The more they laugh, the more they read, and the more the read, the more proficient they become as readers. #titletalk" So true. 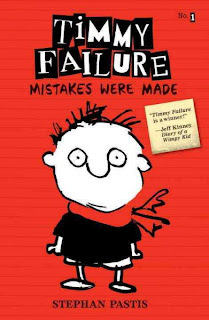 A new favorite funny book in our school library is Timmy Failure: Mistakes Were Made, by Stephan Pastis. Hand this to fans of Big Nate or Diary of a Wimpy Kid. Timmy Failure is the eleven-year old founder of the detective agency Total Failure with his best friend and sidekick Total, a 1,500 pound polar bear. Timmy is utterly serious and entirely convinced of his own importance, even though readers are constantly aware of his incompetence. Kids love being in on the joke, being able to laugh at Timmy's constant troubles and his clueless arrogance. My students love the drawings throughout this story - whether it's of Gabe caught in the act with chocolate all over his face, or Total chomping away in the client's garbage cans. Pastis uses his experience creating the popular Pearls Before Swine cartoon for more than visual humor, though. His story relies on the fast pacing and humor that is the mainstay of comic strips. Timmy comes from a long line of losers we love to laugh at, from Charlie Brown to Calvin (and Hobbes). It takes quite a bit of sophisticated reading skills to get all the humor going on here. Kids will need to be able to see Timmy's perspective and then figure out that other character's perspectives may be different (and actually more believable). Pastis uses fairly sophisticated vocabulary at times, making this better for your 10 and 11 year old than the drawings might initially suggest. For more from Stephan Pastis, check out his site for Timmy Failure. He's headed to California for a tour next month! I also enjoyed listening to a great interview with Stephan Pastis on Apple's Meet the Author podcast, with the ever enjoyable Jenny Brown. Check out her review of Timmy Failure on Twenty by Jenny. You'll also have fun with Betsy's review over at Fuse #8. The review copy was kindly sent by the publishers, Candlewick. If you make a purchase using the Amazon links on this site, a small portion goes to Great Kid Books (at no cost to you!). Thank you for your support. 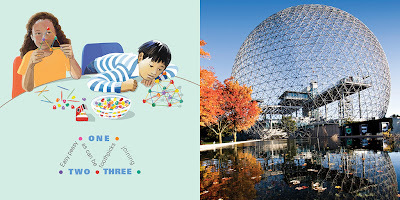 Every child I know has loved building things out of materials they find everywhere - whether it's stacking a huge tower of blocks, or making a pillow fort, or using toothpicks and green peas to make a pyramid. 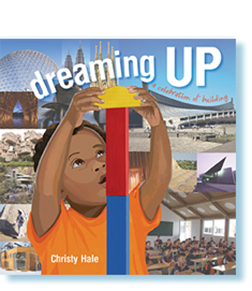 If you have a little builder at home, definitely look for Christy Hale's new book, Dreaming Up. Hale's comparisons and poems are accessible to young preschoolers, but they'll also intrigue seven and eight year olds. 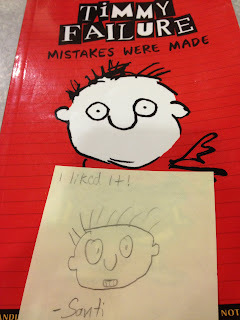 My daughter says, "I *love* that book! The thing I love most about it is that it can be for all age groups. It does not matter if you're a grandma reading it to your little grandchild or if you're a middle school kid who's fascinated by buildings." I especially appreciate the way Hale carefully included so many different children, architects and types of buildings throughout Dreaming Up. As you can see, the children have a range of skin tones and ethnic backgrounds. In the back, you can read about architects ranging from Zaha Hadid, an Iraqi woman who designed the Vitra Fire Station in Germany, to Simon Velez, a Columbian man who designed the Bamboo Church in Columbia. 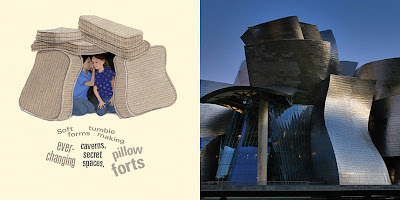 Children will adore the way Hale celebrates their creativity - just look at the building that looks like a child's pillow fort! 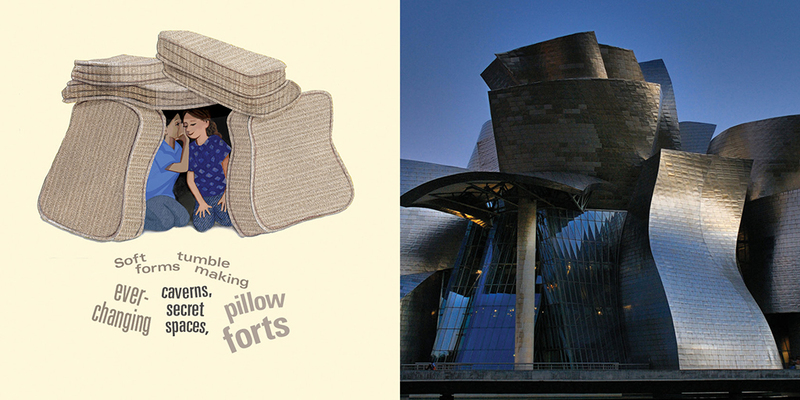 Older children will be interested to read that Frank Gehry's Guggenheim Museum in Bilbao, Spain (pictured above) is located on a river, and that it often gives the impression of looking like a fish or a ship. Children who are interested in learning more will appreciate the extra information Hale includes at the end of the book, especially the quotes and pictures of each architect. All images shared with permission from Christy Hale, © 2012. The review copy came from our school library. If you make a purchase using the Amazon links on this site, a small portion goes to Great Kid Books (at no cost to you!). Thank you for your support. "Oh Romeo, Romeo! Wherefore art thou Romeo?" Do these lines stir passion and longing as you hear Juliet's words? Or do they make you squirm and recall agonizing afternoons trying to slog through Shakespeare plays line by line? Students continue to read Shakespeare's many plays, memorizing passages, learning how to closely read text for themes and character development, and trying to decipher 16th century idioms. Two interesting apps are now available that can help students access and appreciate Shakespeare plays. I would like to share two that I've explored for Romeo and Juliet: one from Shakespeare in Bits and and another from Cambridge University Press. Both apps let students listen to a full cast production of the play while they read along, and encouraged students to explore a vast amount of resources to help them understand the play. The Shakespeare in Bits app will appeal to students who want a visual sense of the story as they listen and read the play. This app combines an excellent full cast narration of the play with a rudimentary animated version enacted on half the iPad screen, while the full text of the play is on the other half. While it sounds cluttered, the design works very smoothly. Each scene is broken into manageable chunks, helping students absorb the original language. I found that students were able to process the meaning of the play more fully as they read, watched and listened to a scene. "Notice the contrast in language between the two characters. Juliet begins by asking Romeo a direct question - how did he find her? But we know by now that Romeo never gives direct answers, and his response here is predictably flowery and evasive." Sprinkled throughout are questions for students to think about. 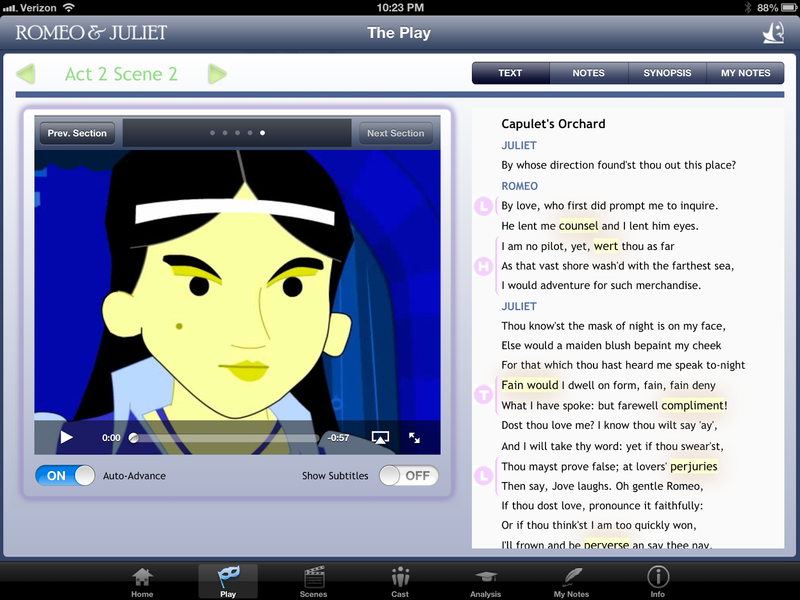 This app does not always provide answers, but rather guides students to their own close reading of the play. Each section is also accompanied by notes and a synopsis, and readers have a place to make their own notes. I found that the notes were written in an accessible way, one that would help students reading on their own. In addition, the app provides a guide for each character, summarizing the different characters' perspectives and roles in the story. Visual learners will certainly appreciate the character map showing the pictures of the main characters linked to one another, as their relationships are arranged. Some might feel that the animations are too rudimentary, but I actually found their simplicity benefited my reading of the play. The images were enough to ground the action of the play, but I was prompted to embellish them in my own mind's eye. They clearly aren't meant to be how the play would seem in real life, but they can provide a visual scaffolding for students. My biggest concern with this app is that it provides too much for students. Will they use the short essays in the Analysis section to replace their own efforts writing analytical essays? Perhaps. But I think that Shakespeare calls for more support than less. designed and developed by Agant Ltd. 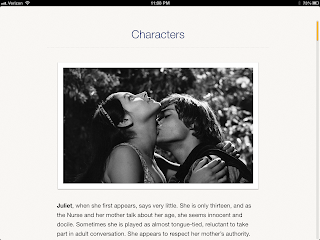 The apps developed by Cambridge University Press are also an excellent way to support students as they read and think about Shakespeare's plays. This app is perhaps more academic, and so may appeal to some students and teachers wanting something with more gravitas. 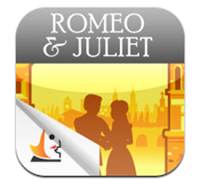 Interestingly, the Cambridge and the Shakespeare in Bits apps both use the same audio narration, a full cast recording produced by Naxos Audiobooks, starring Michael Sheen as Romeo and Kate Beckinsale as Juliet. 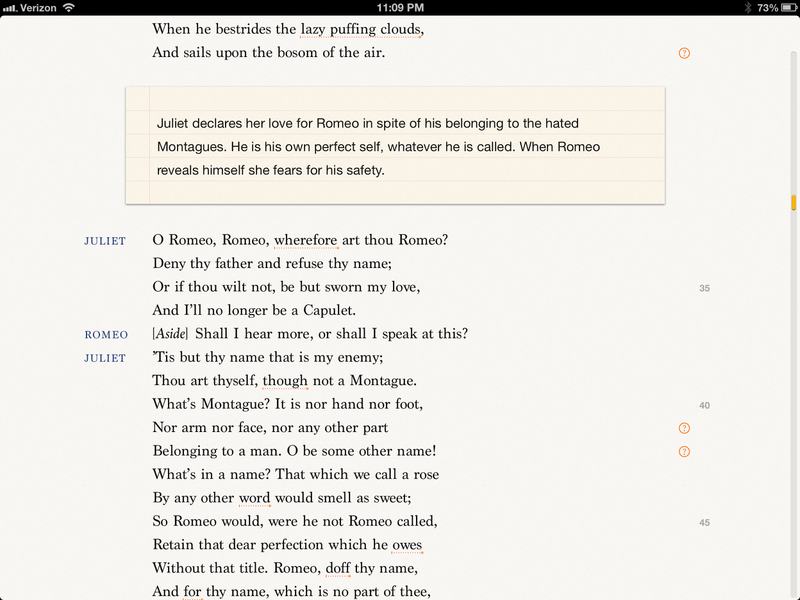 As with the Shakespeare in Bits app, the Cambridge app also allows readers to read along with the full play as they listen to the recording. Readers control several features that support their reading. Standard and academic glossaries provide support for students translating sections to more accessible modern English, and academic notes providing literary and linguistic background. I particularly liked the scene synopses and detailed synopses that were embedded within the text like stage directions. These helped orient me as I started reading a section. Since the language of Shakespeare does not come naturally to our students, it is often helpful if they know what is going to happen before they read a scene. If readers find these distracting, they can easily turn them off. Each scene also begins with a few photographs of live stage, television or movie productions of Romeo and Juliet. This gives students the tangible feeling that the play can be interpreted and staged in many different ways. I found that this app preserved more of a sense of the play as an academic experience, read in a purer form instead of chunked and illustrated. The navigation and coordination of the audio to text are excellent. I can certainly see it appealing to teachers who want students to do more of the figuring out on their own. I definitely recommend taking some time to explore the section "Examine", which includes clear short essays helping readers understand the characters, themes in the play, the history and choices made in staging performances, and Shakespeare's use of language, style and imagery. My biggest concern with this app was that the supporting materials were not as accessible to middle school and high school students. Romeo and Juliet is often read by young teens as their first experience with Shakespeare (often in 7th grade). While I liked the circles of characters, I don't think these are as readily accessible to students without any visual support. The glossaries are not as intuitively supportive as the Shakespeare in Bits glossaries, but they provide more academic support for readers wishing to delve deeper. Read more about Cambridge University Press's Shakespeare apps in this article in the Guardian, a British national newspaper: Do Shakespeare plays smell as sweet when released as iPad apps? Whether you're a parent wanting to help your child experience Shakespeare, a teacher looking for new ways for students to read and think about these plays, or a librarian encouraging patrons to explore new apps, both of these platforms are definitely worth checking out. I know they would have made my experiences fuller and more enjoyable when I was in high school. 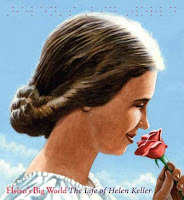 I have admired Helen Keller since I was a young girl. And so I was thrilled to read both Doreen Rappaport’s and Deborah Hopkinson’s new picture book biographies: Annie and Helen AND Helen's Big World. I especially love the way these two books complement each other, helping young readers get a fuller picture of this remarkable woman. Focusing on the relationship between Annie and Helen, Deborah Hopkinson shows the remarkable transformation that happened in an incredibly short space of time. 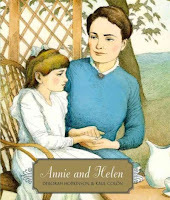 I was particularly struck by how Hopkinson and Colón used primary source documents to give young readers a real sense of Annie and Helen. Doreen Rappaport gives readers a clear sense of Helen's whole life, from the illness that left her blind and deaf as a child, to her years with Annie, and then her accomplishments as an adult. Throughout it, Rappaport highlights Keller's own inspiring words in large, bold print. Young readers will be inspired not only by how Helen overcame her own disabilities, but how she used her voice to speak up for justice and equality for all. Doreen Rappaport tells us that "Helen Keller’s life is the story of empowerment and possibility, a journey from powerlessness to power, from helplessness into helpfulness, from ignorance to knowledge... I realized that kids react emotionally to her struggles and conquering of her extraordinary disabilities. Her life confirms for them that even under the most difficult circumstances people can triumph." Deborah Hopkinson says, "Although the moment at the water pump is now so well-known, actually it’s what happened in the months after that I found most fascinating. It seemed natural to use the details in Annie Sullivan’s letters in my story... Annie’s own excitement and Helen’s amazing progress are palpable in her correspondence." For more of this fascinating conversation, head over to Kidlit Celebrates Women's History Month. While you're there, stay a while and explore the amazing resources they are offering this month. I would like to say a special thank you to Deborah Hopkinson and Doreen Rappaport for their time and thoughtfulness in this interview. The review copies were kindly sent by the publishers, Random House and Disney / Hyperion. If you make a purchase using the Amazon links on this site, a small portion goes to Great Kid Books (at no cost to you!). Thank you for your support.